Regional belonging is a concept I struggle with as a Norwegian. The main reason is probably that we are just too small as a nation to develop much of a regional identity in the modern age, apart from speaking our own dialects. In some ways we are more of a Norwegian region in a Nordic context. I spent a few weeks in Munich this summer as a participant observer, taking part in a work atmosphere – in an actual office, not an international conference. This also gave me the opportunity to seek out a fair number of licensed establishments in my spare time. This made me realize that there are strong similarities among Bavaria and Italy when it comes to pride in their region and its produce. It does not stop at the regional, but keeps going further – you also have a loyalty to your sub-region, etc down to your tiny village. If you can source it locally, you don’t need to get anything from the next town. Obviously this does not encompass capital goods, shoes, clothes and so on. But it is deeply felt in food and beer. I get echoes from my old anthropology lessons here. There seem to be different spheres. There is the hi-tech Germany. The Germany of BMW, Siemens and what have you. This is the economic tugboat that tries to make the rest of Europe move along, grow and prosper. At the same time you have this fascination for the local. For the village where you grew up. Where the traditional values are honored. Where they raise the maypole outside the inn as they used to do. I looked up Heimat, which is a term that is at the core of this. 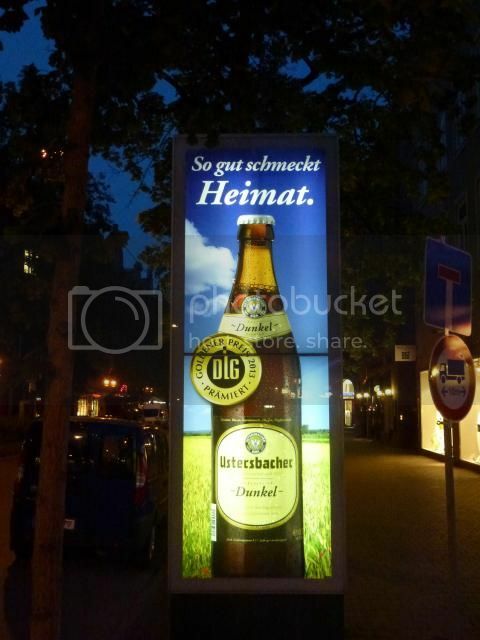 Heimat has no English equivalent. It has to do with ancestry, community and tradition. It has to do with nostalgia for a life that has been lost – torn apart by war and dictatorship and later slowly eroded by economic forces or a government somewhere on the Rhine, or, more lately, the Spree. We don’t have the word in Norwegian,, either. but it is a real factor for us, too, just beneath the surface. Our two referendums on membership in the European Union shows that Heimat and the contrast it offers to those who rule you or want to rule you trumps all other arguments when you really mobilize. But back to the Bavarians and their regional cuisine. The menus are spelling it out. Bavarian asparagus. Bavarian beef and pork. Bavarian trout. Even vegetarian dishes turn up to be focused on Bavarian spuds and leaves. 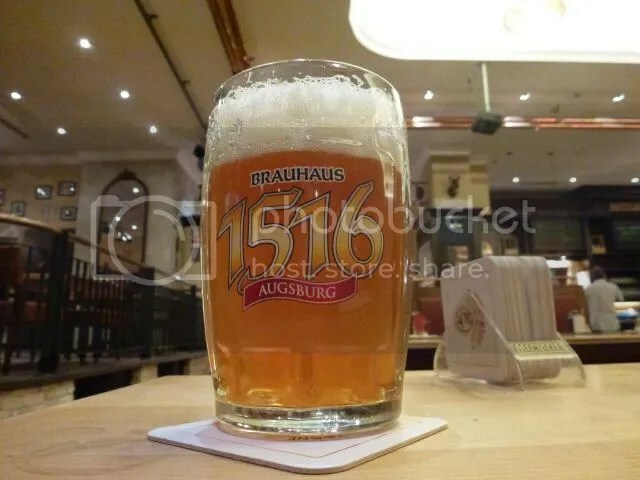 The Hofbräuhaus in Munich has a podcast that manages to find new angles every month. They often focus on where their vegetables, beef, cheese and lettuce come from, interviewing the farmers, who are not only Bavarian, but preferably live in Upper Bavaria. Why is there a brewpub in Munich airport and not anywhere else? Look closer. Sure, they brew beer. But they also boast that 85 per cent of their supplies come from regional produce. Just what you need. It is the last and first stop of your trip to foreign lands, Prussia, or even further away. There is a tragedy at the core of this. The attempts to build a national identity in the 19th and first half of the 20th were not successful. Even cheering for your national football team is a fairly recent event here. German patriotism has been deeply stained. So one has to look inwards, closer to home, to find identity. Living in a federal state with lots of decentralized power in regions larger than many European nations strengthens this trend, it actively encourages it. If you cannot fly your national banner, you can be proud of the Bavarian white and blue. And, in a land of agricultural plenty, let’s be proud of what we can produce. Which is a lot. In a European market overflowing with cut-price meat and vegetables, butter and beer, the regional authorities and trade associations play on this sense of region and Heimat. Be sure to ask for Bavarian quality. Accept no substitutes. Other countries celebrate their days of liberty, of liberation or victories at land or sea. The Bavarians celebrate the Reinheitsgebot of 1516. Sure, there are plenty of Italian restaurants. There are kebab shops on the corners, sushi conveyor belts and cheese counters in the big supermarkets where you can find Italian and French specialities. But the beer is most likely from the local area, even Getränkemarkt bottle shops will have a very limited range of beers. 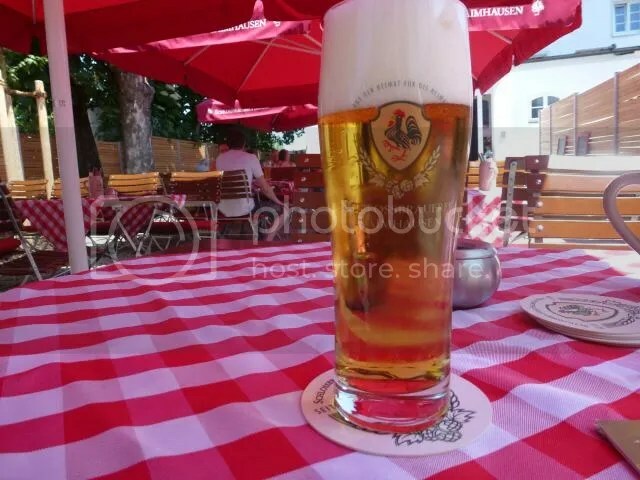 I managed to track down two beer shops in Munich with a broad range of beers. A broad range means hundreds of different beers. Did I find any imports? About a dozen. BrewDog, Corona, Guinness and Pilsner Urquell. No Belgian, no English, no Italian beer. If you look closely, you will find a few IPAs and imperial stouts, but they will be from Bavarian breweries. The innovation in the beer field is coming from small breweries in the region, which pose no danger to the big players. Speciality beers still basically mean beers from tiny family breweries, the most daring of them using smoke malt or having the rebellious streak of offering a Dobbelbock out of season. There is some hope in reports that the big supplier of malt in the region, Weyermann, actively encourages upstart breweries to look beyond the standard range and brew pale ales or other varieties. But you’re not likely to find a trace of these beers when you look at the statistics of annual consumption. So, the important question: Will this change over time? My guess is that the changes will come very gradually. There is some distribution of innovative bottled beers, but I don’t think they will rock the boat. What is needed is someone with financial muscle to establish something that could have an impact in Munich and create a buzz. A Munich brewpub with a beer garden with ample seating for all seasons offering a broad range of beers with inspiration from Belgium and the US could do the trick. But someone with more knowledge about real estate in Munich than me should do the math. I could be greatly mistaken. Things happen fast in the beer world. Maybe there will be a BrewDog bar and a Mikkeller Biergarten challenging the culinary conservatism in a year or two. But I think the odds are better for changes from within.